Emil Lukas is an artist. Sperone Westwater is pleased to present new work by Emil Lukas. His fourth exhibition at the gallery is comprised of four series of paintings and sculpture utilizing materials which have characterized his practice: thread, bubble wrap and larvae. Lukas’ work continues to demonstrate a keen interest in issues of perspective and process. On the first floor is Lukas’ new larvae work, the location of possible and impossible moves, a collection of forty small scale paintings which closely reveal their uniquely organic mark-making, allowing the viewer to examine each trail down to the smallest detail. These marks are layered between wood, paper and glass to varying degrees of transparency, lending the work a photographic quality. Lukas’ bubble wrap paintings continue to explore an inexhaustible fascination with the infinity of color and the human mind’s tendency to seek patterns in random information. This becomes particularly apparent in the two paintings in the main gallery, the largest in the series to date, whose convex sculptural forms force the viewer’s eye to rove across the color spectrum seeking out corresponding elliptical shapes. Several smaller bubble paintings featured on the second floor provide a different viewing experience in which color is heightened and details appear magnified. The two epic thread paintings twin orbit south and twin orbit north (each almost 80 inches in diameter) demonstrate an exciting new direction in this series by migrating to a circular format. The accumulation of the thread in this shape creates an illuminated atmosphere which quietly hums with optical vibrations. In Lukas’ newest stack works on the third floor, he employs elements that suggest a continuous state of flux and becoming—structural fragments, larva-inked tubes, thread and conical shapes. Intended to be experienced as chapters—and documented as such in books made by the artist—the individual layers reveal the archeology of Lukas’ wide-ranging practice. Born in Pittsburgh, Pennsylvania, in 1964, Emil Lukas has exhibited throughout the United States and abroad. His work is in important private and public collections, including the Panza Collection (Italy), the Dakis Joannou Collection (Greece), the Anderson Collection (California), Margulies Collection (Miami), Baltimore Museum of Art, Crystal Bridges Museum of American Art (Bentonville, Arkansas), Museum of Contemporary Art San Diego, Pennsylvania Academy of Fine Arts, San Francisco Museum of Modern Art and Weatherspoon Art Museum (Greensboro, North Carolina). 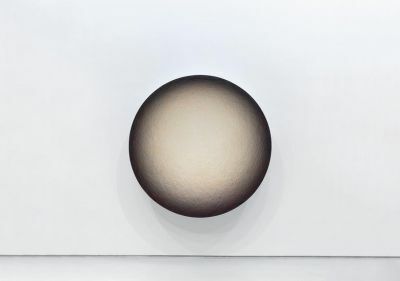 Emil Lukas is on view at Sperone Westwater from 9 January – 23 February 2019.